So a few weeks ago I received a fabulous package from the lovely Tomas in Conefrey's Pharmacy. 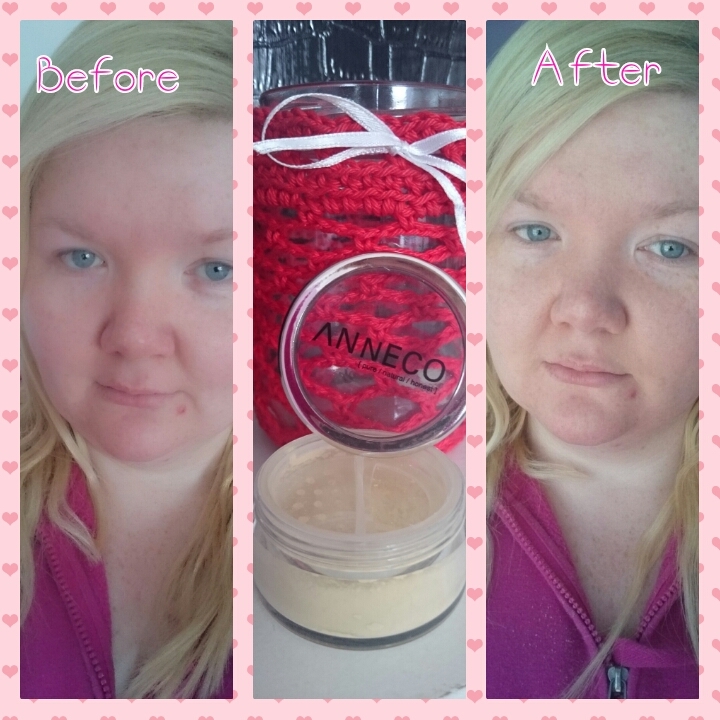 I received some Anneco Mineral Make Up. 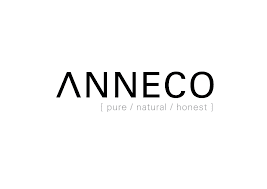 Ladies I am 100% ashamed to say I had never heard of Anneco before so I was really intrigued to use it. 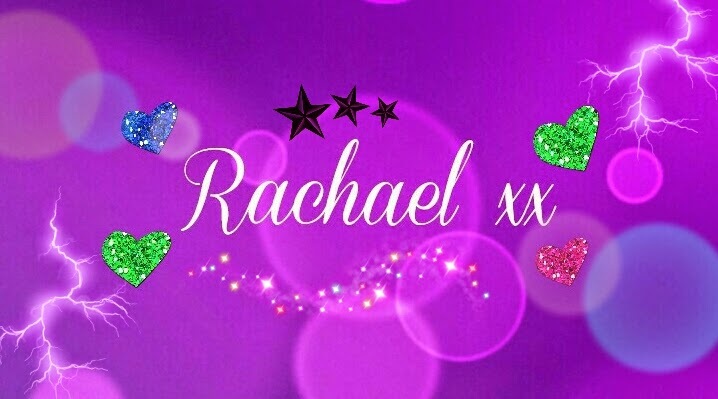 We have all heard of Bare Minerals, I mean who hasn't. You most certainly must have been living under a rock if you haven't. Anyways I was very intrigued about Anneco so I set off to compile some research. Well holy god say's Miley! This is one of our own, its a home grown Irish product. I mean it doesn't get much better than that. Ann Shields is the founder of Anneco and is an original "Galway Girl" who is now based in Co. Laois. Ann grew up on a farm and her interests in all things natural stemmed from this. Ann has a background in beauty and has International Qualifications in Aestheticienne. Through her interest in cosmetics Ann began to research natural alternatives to the chemical laden makeup which have swamped our stores. Ann developed a range of mineral makeup. She noticed a movement towards natural products and began to research how to make cosmetics focusing on natural beauty products. She completed cosmetic courses in London and also a course in the U.S. with Botanical Blend tutor Cinda Phelps. 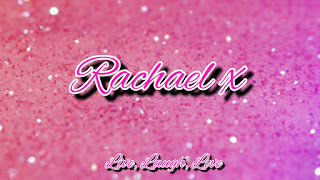 So I received 3 lovely products in the range, the Mineral Foundation, Colour Corrector and Blusher. As you can see above the packaging is very neat and simple. No fuss. Anneco claims " Our Vegan, 100% pure Mineral Foundation is made of top grade mineral ingredients that help to nourish skin and provide a flawless look naturally. It goes on easy and feels like nothing at all while providing excellent coverage and soft focused effect that helps to blur fine lines and wrinkles". Well ladies let me tell you I can 100% stand behind this statement, and I will show you below. Now we all know mineral make up is certaintly not a new revelation, as it has been around for donkeys years! Cleopatra with her kohl mineral eyes and flawless skin is a prime example of how valued mineral cosmetics were centuries ago. Anneco have been inspired by the old traditions and have researched new innovate forumlations with advanced technology to produce high quality mineral cosmetics. The naturally flattering earth colours have been carefully blended at Anneco to create makeup which as well as being pure, natural and honest, feels smooth, silky and looks radiant on the skin. It also has excellent healing and renewal properties. Now lets take a closer look at this! I was so excited unpacking these as it was my first time using Mineral Make Up. I had the perfect Kabuki brush to use in my set so was overly excited! The makeup is 100% pure mineral ingredients and no additives that would cause any skin irritations. Since I started using the mineral makeup I cannot get over how lightweight it feels on my skin. It's hard to believe that I am wearing foundation. I noticed that it gets absorbed quickly creating a very natural look. The trick is to swirl the mineral foundation in the lid and then poke the bristles into the skin and blend. You dont need to apply an awful lot as it blends very well and gives great coverage. I was so impressed with this. It made my skin look healthier, it had a natural brightness without using any blusher or highlighter. The packaging says it contains SPF 40 and anti ageing ingredients. The foundation never looked powdery or dry and to me it feels as if it is allowing the skin to breather underneath. I used my Nivea post shave balm as my primer under this. 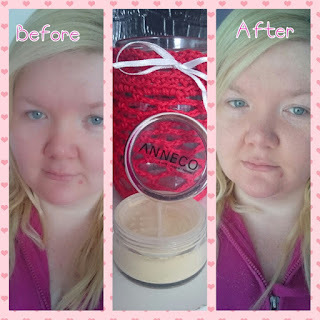 The beneficial qualities in mineral makeup such as Anneco include anti inflammatory properties which can help someone like myself who suffers from rosacea. The ingredients reduce redness and swelling. I whole heartedly love this foundation and will be repurchaasing! Anneco Mineral Foundation is available in six different shades so you are sure to find one which suits your skin pigmentation. This wonderful product is scented with orange essential oils and contains an spf of 40 which protects from UV rays and free radicals which cause premature ageing to the skin. This range of products are super kind to the skin as they contain no artificial or chemical additives. This retails at €25.50 for 12grams of products compared to the €29 euro price tag for Bare Minerals and it is only 8 grams of product. I also use this on nights out as my setting powder over my normal foundation to enhance that flawless look. Below I am just wearing the Anneco Foundation for a natural daytime look. This product has saved me so many times in the last two weeks, I honestly do not know what I did without it. After having treatment for my illness I suffer from alot of rosacea, and look like a tomato. This colour corrector neutralised the colour in my face. I received the colour corrector in yellow which isn't typically designed for rosacea. The green is for redness, but I felt this yellow corrector brightened and covered the redness. The yellow base counteracts any dark circles on the skin, so would be ideal for under your eyes or for setting your concealer under the eyes. Again I applied this following my Post Shave Balm as my primer, and used a round topped Kabuki brush. I only used it in the areas need. I purposely did not use foundation in the picture below as I wanted to be able to show how good this product is. Green colour corrector will neutralise and correct rosacea, red spits, broken capillaries and sunburn. Yellow will camouflage dark circles, giving a brighter look. Blue colour corrector with correct yellow tones in the skin and dark pigmentation spots in the complexion. I have the green on my wishlist at the moment, along with the primer, which is meant to be unreal. Have a peek at the picture below and see if you can spot the difference in colour in my face! No more Tomato Head!!!!! My skin looks a lot brighter and clearer with no redness! I love this product. It is retailing at €14.50 which is excellent value for a mineral colour corrector. Anyone with rosacea or dark circles then you need this. So last but not least! I was blown away with how good these all were. Has anyone else used this range? Let me know. Special thanks to Tomas for introducing me to the range.